Dublin Street Parking Services has successfully operated the on-street enforcement contract on behalf of Dublin City Council since 2004. We strive to promote sensible parking in order to reduce traffic congestion. We deliver the enforcement service in a balanced way dealing with situations that arise in a practical manner. We adopt a ‘firm but fair’ approach which reflects the consistency and transparency in all we do. Provide Dublin City Council with a service that is high quality, professional and continually improving. Build and support our team to provide an on-street customer service that is second to none. Perform to the highest level of quality at all times. 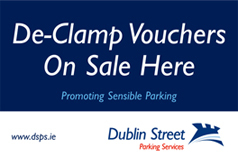 Pay cash where you see De-clamp Voucher on sale here!